RAYMONDVILLE — The secret is out. Willacy County sold the former Willacy County Correctional Center for $2.025 million to Management & Training Corp., or MTC, as part of an agreement which released it of its $68 million debt to the prison’s bond holders. Yesterday, County Judge Aurelio Guerra released the details of the March sale after the Valley Morning Star filed a request under the Texas Open Records Act. As part of the sale, the agreement also will pay the county $3 a day for every inmate held in the facility. Under the agreement, MTC apparently paid the bond holders about $68 million after they demanded payment. Meanwhile, MTC has declined to disclose information regarding its purchase of the 53-acre property along Interstate I-69. Recently, the appraisal district appraised the property at $29 million. At its current appraised value, the property is projected to increase the city of Raymondville’s total appraised property value from $166 million to $184 million, pumping $143,000 into city coffers, City Manager Eleazar Garcia said. Now, Lopez is planning to re-appraise the property early next year. MTC is making improvements expected to increase the property’s taxable value, he said. “They’ve been doing a lot,” Lopez said. MTC is repairing and making improvements to the facility’s 1,000-bed concrete housing unit, spokesman Issa Arnita stated yesterday. Earlier this year, MTC removed 10 Kevlar-covered domes damaged in the February 2015 riot that led to the 3,000-bed prison’s closure. Arnita said MTC continues working to secure a contract to hold inmates in the facility. The closure of the prison, which paid the county for every inmate it held, led to 400 employee layoffs, slashing a third of the county’s $8.1 million general fund budget and plunging the area into financial crisis. MTC, a national prison operator based in Centerville, Utah, was one of the companies involved in the original deal that led to the facility’s development as a detention center developed to hold undocumented immigrants in 2006. 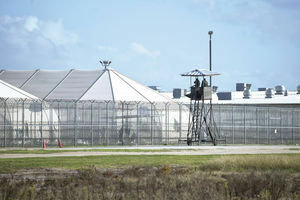 The county bought the facility largely made up of tent-line domes for $60 million, refinancing the detention center to turn it into a minimum-security prison in 2011. MTC currently operates a 500-bed Willacy County-owned prison holding inmates for the U.S. Marshal’s Service. In 2003, MTC was one of the companies behind the development of the $14 million deal that led to the county’s purchase.